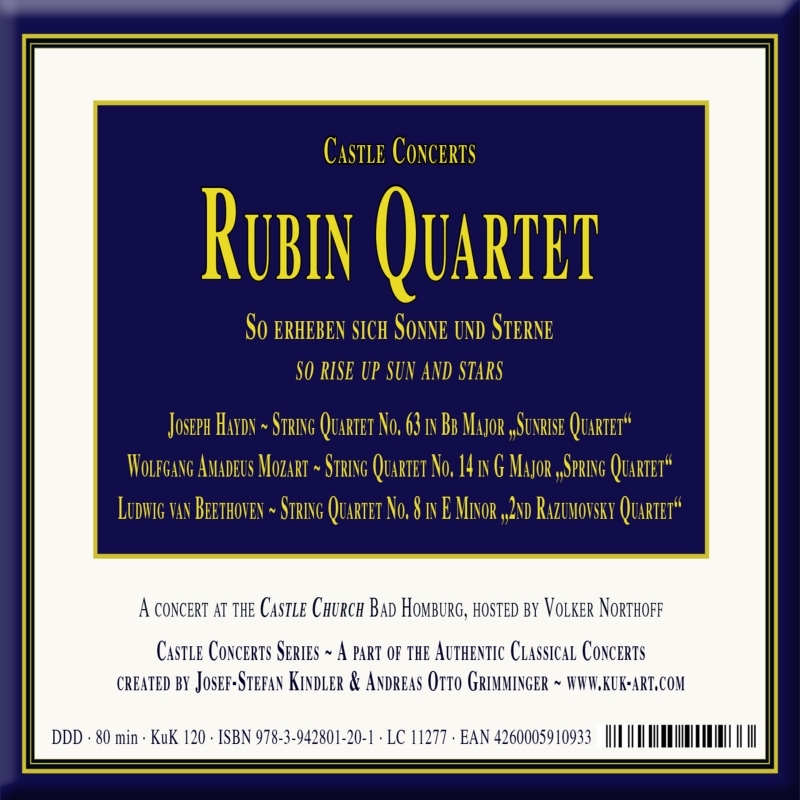 With three exceptional masterpieces by Joseph Haydn, Wolfgang Amadeus Mozart and Ludwig van Beethoven, the Rubin Quartet is following this historical track. Haydn's string quartet cycle op. 76 came into being due to a common practice of the time, whereby princes, kings, merchants or high-ranking clerics would commission their subordinate court musicians to write pieces of music. Haydn received 100 ducats from Count Joseph Erdödy for the six quartets in 1797. More than two hundred years later they appear like the sum of his art within this genre that he influenced so greatly. 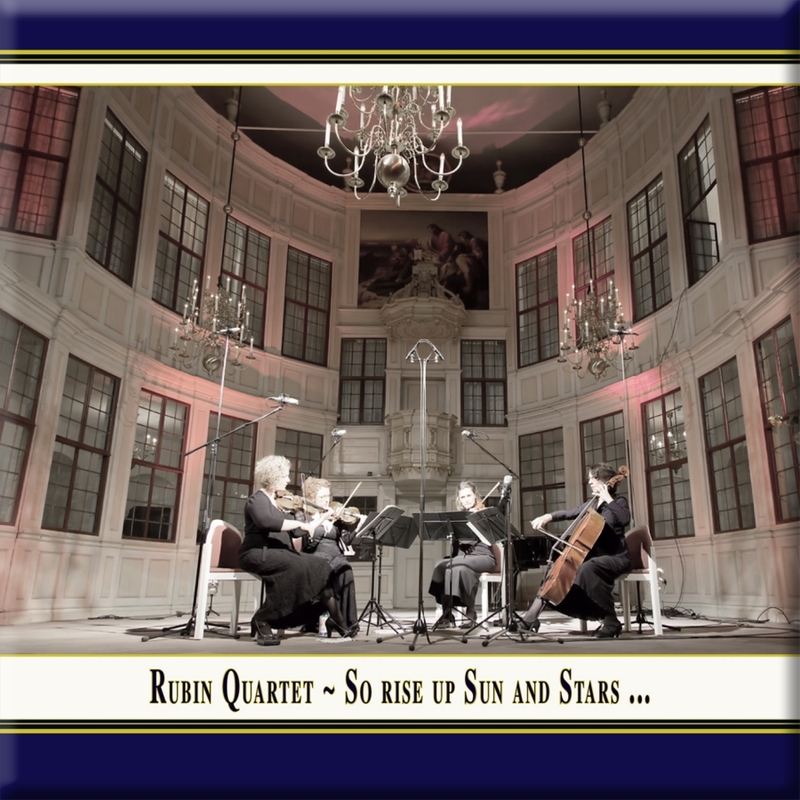 The "Sunrise Quartet" in B flat major is the fourth quartet of the work. The name was given retrospectively and is extremely apt: in the first movement, after a few attempts, the first violin leaps from faint sounds into a resonating B major fortissimo that emerges like the rising sun. While Haydn was still composing for the nobility, Mozart's K 387 came about in a time of artistic reorientation and independence. Mozart had lived in Vienna, the city of great freedom, since 1781. He had exchanged the position of court musician at the Salzburg archbishopric for the life of a free musician. At Christmas time in 1782 he began a six-part quartet cycle, the first piece of which was K 387, inspired by Haydn's string quartet op. 33, which had appeared in the same year. Mozart showed his huge respect for the great master in the dedication: "To my dear friend Haydn." More than 20 years later, Beethoven began writing to create a string quartet cycle of at least three parts. He was already living in Vienna after turning his back on the electoral court orchestra in Bonn in 1792. But there were still patrons at this time too. This is how op. 59 received its other name, the "Rasumovsky Quartets": the cycle was commissioned by the Russian diplomat and patron Andrey Rasumovsky. The Rubin Quartet plays the second string quartet from this cycle, whose slow movement Beethoven composed - according to his pupil Carl Czerny - as he "looked up to the starry sky and pondered the harmony of the spheres". This work played together with Haydn's quartet op. 76 no. 4 covers stages "from sunrise to starry skies". String Quartet No. 63 in B Flat Major, Op. 76, No. 4 "Sunrise Quartet"
String Quartet No. 8 in E Minor, Op. 59, No. 2 "2nd Razumovsky Quartet"
A concert recording from Bad Homburg Castle (Germany), November 9th 2014, recorded, released & created by Andreas Otto Grimminger & Josef-Stefan Kindler in cooperation with Volker Northoff.